I'm just going to go ahead and write what I secretly know that everyone is thinking and that is, if you transport Victorian British detectives to Generation X sitcoms of the 1970s, then Sherlock Holmes is totally Marcia Brady. And now, courtesy of those intellectual and artistic geniuses at Acorn Media who would never dream of comparing literature's most famous detective to a self-obsessed girl who always had no shortage of dates to the prom, we're given the opportunity to meet several different versions of Jan Brady via the title, The Rivals of Sherlock Holmes: Set 1. 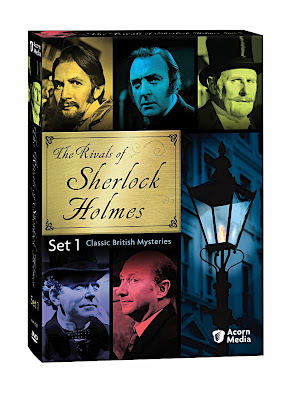 Taken from the first thirteen episode season of the 1971 ITV Network series produced by Thames which garnered the artistic design department a BAFTA for their impressive recreation of forensic laboratories, eerie manors, drawing rooms, shady boarding houses, and intricate costumes from London's Victorian era, The Rivals of Sherlock Holmes was eventually followed by a second and final season which also ran for thirteen episodes two years later in 1973. With the upcoming holiday release of the big screen adaptation of Sherlock Holmes starring Robert Downey Jr., timing couldn't be better for British mystery lovers to celebrate all things remotely Holmes related. And although I must confess that I did find more than half of this series entirely too predictable and downright snooze-worthy, it was a great deal of fun to relish in what has become essentially the UK's most prolific output aside from the Bard given their fondness for a wicked, bloody whodunnit. Obviously Sir Arthur Conan Doyle's Sherlock Holmes is the most respected, heavily influential and analyzed character of the fictitious detectives who would've been his colleagues or "contemporaries" we witness herein, yet the diversity in the style of sleuthing and personality of the various detectives included is definitely worth investigating. Despite the faded look of the most likely video-captured '70s low-budget series, Rivals benefits immensely by memorable turns from esteemed and iconic acting veterans such as Halloween's Donald Pleasence, John Neville, Jeremy Irons (in his first official onscreen role), Donald Sinden and Peter Vaughan who brought characters including Guy Boothby's Simon Carne, Ernest Bramah's Max Carrados, R. Austin Freeman's Dr. Thorndyke to life. Inspired by the work from author Graham Greene's older brother and BBC director-general Hugh Greene who'd published anthologies that showcased the lesser-explored detectives in a series of works that shared the same title Rivals creators would employ, the slim-packaged four-disc set gets off to a smart if rocky start with "A Message from the Deep Sea." Despite the boldness in their decision in selecting a character of whom most readers are at the very least aware and playing with the classic "locked door" structure, "Sea" is bogged down by Dr. Thorndyke himself as his obnoxious God-complex is far too much to handle when presented with it on disc instead of on the page. Still, despite my dislike of the insufferably smug and egotistical Dr. Thorndyke, Rivals' opener nonetheless manages to establish the same theme that will run throughout the series as the characters upstage the bumbling official investigators at Scotland Yard with their dogged determination to avoid pinning a murder on an individual just because it's the most convenient solution. Yet ego is one thing, swindling those who hire detective is something else altogether as we encounter a few detectives who steal incriminating documents being held over a client's head and them sell them back to the individuals to avoid larger blackmail (and give themselves double the money with half the ethics) and another character who double crosses everyone in a magician level hoax involving diamonds and other priceless items. While it's amusing to see the way that private investigators who spend so much time studying deception become masters of the art of manipulation themselves, throughout the set we realize that several stories seemed like they were missing at least one or two vital twists that would've enabled us to-- if not empathize or approve-- then at least feel like we were somehow invested in the experience that otherwise keeps us at an arm's length. Overall, the series seemed coolly detached and as vain as the individuals characterized at its worst and incredibly fascinating at its best. However, special mention must be given to the standout episode "The Missing Witness Sensation" as our blind amateur detective Max Carrados goes from accidental witness to hostage in a true nail-biter. In the end while I'm glad I had the opportunity to meet numerous versions of Jan Brady including a few that did inspire me to explore the true source material in literary form, ultimately, Marcia Brady doesn't have a thing to worry about since the Rivals don't come close to the real Sherlock Holmes.